In the more than four decades since the discovery of the Earth's Van Allen radiation belts, it has proved difficult to confirm the principal source and loss mechanisms that control radiation belt particles. At geostationary orbits geomagnetic storms have been found to cause significant variations in trapped radiation belt relativistic electron fluxes, through a complex interplay between competing acceleration and loss mechanisms. Reeves et al. found that geomagnetic storms produce all possible responses in the outer belt flux levels, i.e., flux increases (53%), flux decreases (19%), and no change (28%) [Reeves, 1998]. Understanding the loss of relativistic electrons is a key part to understanding the dynamics of the energetic radiation belts. Large flux decrease events were first studied by Onsager et al. , while an extended dataset was investigated by Green et al. . Flux decrease events usually begin in the pre-midnight sector (1500-2400 MLT), and typically show decreases of around 3 three orders of magnitude in >2 MeV electron flux within a few hours of onset, followed by an extended period of low flux suggesting permanent electron loss. Green et al. investigated three possible mechanisms for the apparent loss of electrons during the flux decrease events: (1) adiabatic motion; (2) magnetopause encounters; and (3) precipitation into the atmosphere. Adiabatic motion caused by the stretching of magnetospheric field lines during a magnetic storm was suggested as the cause of the flux decreases, but not the permanent loss of electrons. Magnetopause encounters were discounted as a mechanism for electron loss as the magnetopause did not overlap with the loss regions, and the associated loss of protons expected through this mechanism was not detected either. Precipitation into the atmosphere of electrons driven into the bounce loss cone was suggested as the primary loss mechanism, through interaction with electron cyclotron harmonic waves [Horne and Thorne, 2000], electromagnetic ion cyclotron (EMIC) waves [Summers and Thorne, 2003], whistler-mode waves [Horne and Thorne, 2003], separately or in combination. A significant loss mechanism that removes trapped relativistic electrons from the radiation belts is Relativistic Electron Precipitation (REP) into the atmosphere. REP has been observed to take several forms, one of which is relativistic microbursts which are bursty, short duration (<1 s) precipitation events containing electrons of energy >1 MeV [Imhof et al., 1992; Blake et al., 1996]. Observations from the SAMPEX satellite show that REP microbursts occur at about L=4-6, and are observed predominantly in the morning sector. Primarily because of this local time dependence microbursts have been associated with VLF chorus waves [Nakamura et al., 2000; Lorentzen et al., 2001b]. Recently, subionospheric propagation probing observed both REP microbursts and slower REP processes, with timescales of tens of minutes, during the January 2005 "MINIS" balloon campaign [Clilverd et al., 2006]. To the best of the authors knowledge, this was the first ground based observation of microburst REP, to date unreported even by multiple balloon campaigns (e.g., MINIS) that were focused upon this goal. Figure 1 shows an example of the subionospheric VLF observations reported by Clilverd et al. . 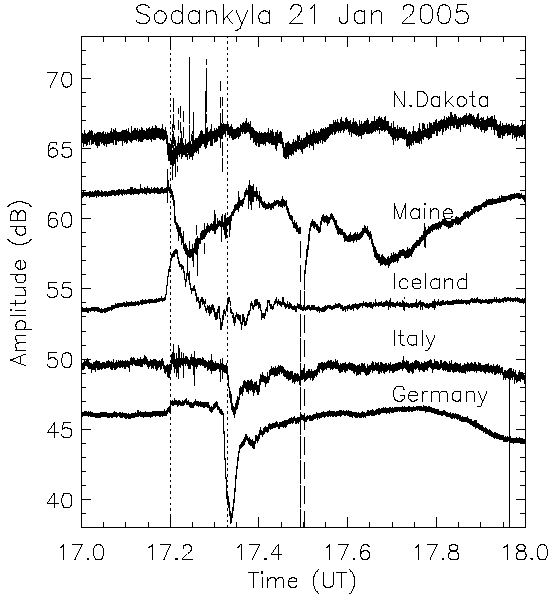 The amplitude of multiple transmitters, received at Sodanklya, Finland, is shown for the time period 17-18 UT during which SLOW REP was reported by X-ray detectors onboard the MINIS balloons. Both SLOW (timescales of tens of minutes) and FAST (short-lived spikes) are present in the data. The FAST changes are believed to be due to REP microbursts. Figure 1. The amplitude of transmitters received at Sodankyla, Finland, during 17–18 UT. The vertical dashed lines indicate times of X-ray bursts observed on the MINIS balloons [after Clilverd et al., Fig. 3, 2006]. In addition to REP microbursts there is also another REP phenomena, which occurs in long-lived bursts lasting longer time periods. Precipitation events lasting minutes to hours have been observed from the MAXIS balloon. They occur at about L=4-7, are observed in the late afternoon/dusk sector, and may be produced by EMIC waves [Millan et al., 2002]. Loss rates suggest that these minute-hour events are the primary loss mechanism for outer zone relativistic electrons. Clilverd et al. recently examined the "SLOW" REP, focusing on the total trapped flux lost into the atmosphere. Their study focused upon sudden electron flux decrease of 17 UT January 21, 2005. The event shows similar local time dependence and flux level changes as those reported by Onsager et al. and Green et al. . The Clilverd-study concluded that ~1/2 of the sudden electron flux decrease precipitates into the atmosphere over 2.7 hours, between L=4 and 6. Estimates of flux losses due to relativistic microbursts show that they could empty the radiation belt in about a day [Lorentzen et al., 2001a; O’Brien et al., 2004]. SAMPEX observations have also shown that REP microbursts are often accompanied by non-relativistic (>150 keV) microbursts, but the bursts in the two energy channels do not exhibit a one-to-one correspondence. Non-relativistic (>150 keV) microbursts are also of short duration (~0.2-0.3 s), and occur on the dayside [Anderson and Milton, 1964; Datta et al., 1996]. Rocket and balloon measurements indicate that the precipitating electrons are primarily in the tens to hundreds of keV range, with negligible fluxes above 1 MeV [Imhof et al., 1989; Reinard et al., 1997]. Due to the integral flux detectors present onboard SAMPEX, limited information on the energy spectra of REP microbursts has been available to date. REP microbursts are correlated with satellite observed VLF chorus wave activity [Lorentzen et al., 2001b]. The short duration of microbursts, similar to the individual elements in VLF chorus, as well as the similarity in LT distributions have lead to the widely held assumption that REP microbursts are produced by wave-particle interactions with chorus waves. However, this has yet to be confirmed, and a one-to-one correlation of REP microbursts and chorus elements has yet to be demonstrated. Ground based observations of REP microbursts confirm the highly energetic spectra, but are not consistent with the calculated energy spectra expected for precipitation from resonance with chorus waves [Rodger et al., 2007]. However, this may indicate the very difficult task of adequately modelling the interaction of VLF chorus waves with energetic radiation belt particles during geomagnetic storms. Nonetheless, the satellite and VLF subionospheric measurements are agreed as to the extremely high-energy nature of relativistic microbursts. As noted above, slower forms of REP have also been reported, and are thought to be significant to the loss of relativistic electrons from the radiation belts. For example, REP has been observed as a near-continuous process lasting lasting minutes to hours, measured during balloon campaigns [Millan et al., 2002]. This time-scale of REP was linked to EMIC waves, although no wave observations were undertaken during that study. The mechanism proposed suggests that relativistic electrons would be rapidly driven into the bounce loss cone through interaction with electromagnetic ion cyclotron (EMIC) waves [Summers and Thorne, 2003]. EMIC waves occur in the Pc1-Pc2 frequency range (0.1-5 Hz) and are generated near the magnetic equator by unstable distributions of ring current ions. The waves can propagate away from the generation region roughly along the geomagnetic field lines and can also be observed on the ground [Erlandson et al., 1996]. In practice EMIC waves are generated in the magnetosphere as left-handed waves, but can convert to right-handed polarization during propagation. The observation of left-handed waves on the ground allows assumptions as to the L-shell of the source region. For at least 3 decades multiple theoretical studies have demonstrated that EMIC waves should be an effective mechanism for loss of >1 MeV electrons from the radiation belts in regions of increased magnetospheric particle density [Engebretson et al., 2008, and references therein]. To the best of the authors’ knowledge, it is only very recently that experimental evidence has been presented that demonstrates the link between EMIC activity and REP. Subionospheric VLF measurements made during a large geomagnetic storm on 21 January 2005 detected a 50 min precipitation event which peaked at the same time as a Pc-1 EMIC wave detected at L=3.4, probably associated with the location of the eroded plasmapause [Clilverd et al., 2007a]. Further evidence comes from satellite observations during a moderate geomagnetic storm in which regions of 30-80 keV proton precipitation were found to be co-located with those of relativistic electrons (>1.5 MeV) [Sandanger et al., 2007], consistent with EMIC-driven precipitation of both low-energy protons and highly energetic electrons. Figure 2. Upper two panels show Oulu (L=4.6) pulsation magnetometer data from 19-21 UT on 7 February 2007 indicating the presence of IPDP EMIC activity occurring during a minor geomagnetic disturbance (Kp=3.7, Dst=-12 nT). The lower panel contrasts the subionospheric precipitation monitor amplitude of GQD for 3 days centered on the event day (solid lines), and the absorption data from the Finnish riometer chain (dotted lines) on 7 February 2007. The riometer absorptions have been multiplied by 5 and shifted so as to appear on this plot [after Rodger et al., Fig. 2, 2008a]. Confirmation of REP generated by EMIC waves has come from subionospheric VLF observations from the AARDDVARK network. A series of case studies have been presented from the Finnish sector combining multiple ground-based observations linking EMIC to relativistic precipitation [Rodger et al., 2008a]. Events showing EMIC waves, observed by ground-based pulsation magnetometers, were shown to be linked to strong responses in the subionospheric precipitation monitor. An example is shown in Figure 2, which is drawn from 2 of this paper. The upper two panels of Figure 2 present two hours of pulsation magnetometer observations from the Oulu site on 7 February 2007. Strong EMIC waves were detected in the frequency range 0.35-1.2 Hz from 19:31 UT, lasting until 19:50 UT, and peaking at 19:38 UT. We classify this EMIC wave activity as IPDP, which is characterized by Pc1 pulsations that rise in frequency over the duration of the event. Such events are generally more intense than Pc1s and thus may be more efficient for particle scattering. At the top of the plot we show the mean EMIC wave power in the band 0.5-3 Hz. The peak power of the EMIC wave activity in Figure 2 was observed at Oulu, where the polarization of the wave at this station was predominantly left handed, again confirming the nature of the wave as EMIC. This also indicates that the source is near the L-shell of Oulu.The lower panel of Figure 2 compares the subionospheric and riometer precipitation monitors during this time. 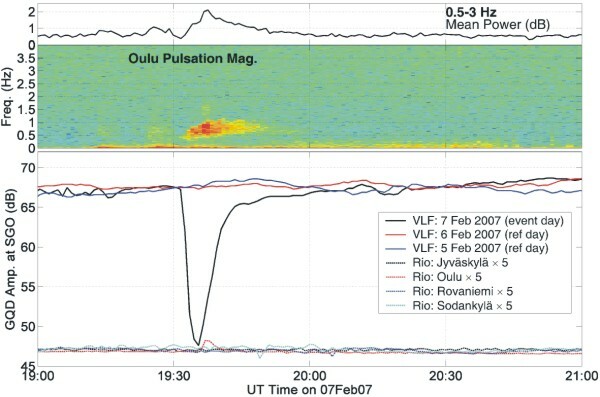 The solid lines show the 1 min resolution amplitude of the VLF transmitter GQD as received at Sodankylä for 7 February 2007 (black line), and the two previous days (red and blue lines) to provide an indication of typical subionospheric propagation conditions. At the time of the Oulu-observed EMIC wave activity, a large decrease in the subionospheric amplitude is observed, reaching -20 dB at ~19:36 UT, and recovering over the following ~30 min. There is no response on the path from NRK to Sodankylä (L=5-6), indicating that the ionospheric changes are only occurring equatorward of these L-shells. The magnitude of this decrease is dramatic, and larger than the changes observed during intense precipitation events in large geomagnetic storms (e.g., 21 January 2005; Clilverd et al. [2007a]). Such a large change strongly suggests that precipitation striking a region at about 1400 km from the transmitter (at L=4.3) could be modifying the location of the modal minimum (i.e., a null in the transmitter signal strength) that normally lies close to SGO. Changes at this location have been identified, through our modeling, as being capable of producing large amplitude variations at SGO. This region is at a very similar L-shell to that determined using the EMIC wave observations. This instrument response reported in the Rodger et al. [2008a] study consistent with precipitation occurring near the plasmapause, where EMIC waves may resonate with relativistic electrons [Meredith et al., 2003]. During these events there were only small responses in the Finnish riometer chain measurements, consistent with relativistic precipitation causing peak ionization enhancements well below the altitudes where riometers are most sensitive. Modelling presented in this study showed that the instruments response was consistent with an ionospheric modification is caused by the precipitation of 2 MeV monoenergetic electrons with flux 500 el. cm-2s-1str-1keV-1 [Rodger et al., 2008a], that is a >10 dB amplitude decrease in the subionospheric precipitation monitor, accompanied by a <0.2 dB increase in riometer absorption. This study shows that EMIC waves and intense relativistic electron precipitation can be strongly linked, as expected by previously reported theoretical modeling.